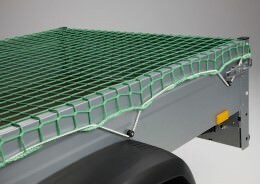 Cargo nets and cargo sheets have proved extremely effective for securing cargoes properly. 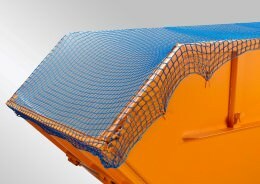 The nets supplied by Safetynet365 keep other road users safe from any goods that may fall out. The measurements of our cargo sheets are designed to fit the standard sizes of trailers or open flatbeds. It protects both small trailers measuring 1.3 x 2.5 m and large flatbed trucks with loading areas of 2 x 2.7 m.
The cargo tarpaulins are made of polyethylene, a UV-resistant, highly tear proof and therefore durable material. 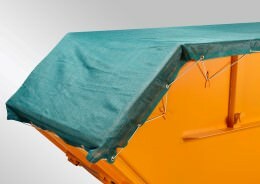 The special feature of Safetynet365’s cargo tarpaulin is its air permeable fabric, which not only protects the cargo from solar irradiation and other influences, but at the same time also prevents the tarpaulin from ballooning in the wind. Some tarpaulins are equipped with a rubber tensioning rope running all around the border for attachment to the vehicle. If our tarpaulin sizes are not designed to fit your vehicle, we offer a special service. You have the option of having the cargo tarpaulin individually made to measure for your vehicle. In addition, our shop stocks further accessories – such as tensioning ropes, fasteners or lashing straps, which ensure optimal anchorage for your cargo sheet.